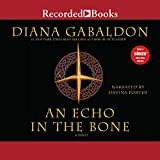 An echo in the bone [sound recording] : a novel / Diana Gabaldon. Material type: SoundPublisher: [Prince Frederick, Md.] : Recorded Books, p2009Description: 40 sound discs (46.5 hr.) : digital ; 4 3/4 in.ISBN: 9781440745522; 1440745528.Subject(s): Randall, Claire (Fictitious character) -- Fiction | Fraser, Jamie (Fictitious character) -- Fiction | Scottish Americans -- Fiction | Time travel -- Fiction | North Carolina -- History -- Revolution, 1775-1783 -- Fiction | Highlands (Scotland) -- FictionGenre/Form: Love stories. | Fantasy fiction. | Historical fiction. | Audiobooks.DDC classification: 813/.6 Read by Davina Porter.Summary: In the seventh installment of Diana Gabaldon's Outlander series, Jamie Fraser and his time-traveling wife Claire face an abundance of daunting obstacles in the midst of the American Revolution. While they already know how history will play out, they are uncertain of their own futures. In the seventh installment of Diana Gabaldon's Outlander series, Jamie Fraser and his time-traveling wife Claire face an abundance of daunting obstacles in the midst of the American Revolution. While they already know how history will play out, they are uncertain of their own futures.